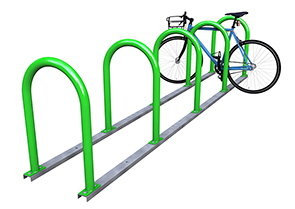 Providing bike parking is more accessible, secure and convenient with the Heavy Duty Hoop Racks on a Rail Mount. 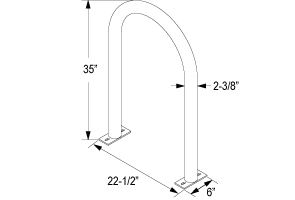 Combining the beefed up, Heavy Duty Hoop Rack mounted on the sturdy 3/16" steel side rail mounts, creates efficient, clean parking for 6 to 12 bicycles. Each Heavy Duty Hoop Rack meets the APBP guidelines offering 2 point of contact and U-Lock compatibility. With pre-drilled holes in the galvanized rails, attaching the racks is simple and more economical than installing each individually. Highly flexible and durable, the Heavy Duty Hoop Racks on Rail Mount is able to move where it's needed the most and anchor easily to the ground.